Based on 17 years of experience with Primavera and ERP solutions, Project Partners developed Oracle Accelerate for IT Portfolio Management With Oracle's Instantis EnterpriseTrack to meet the growing need to manage IT costs at their source. The solution is aimed at mid-size to large organizations that want a complete, integrated IT Portfolio Management solution with integrated cost and resource management capabilities, via a rapid deployment at a fixed price. 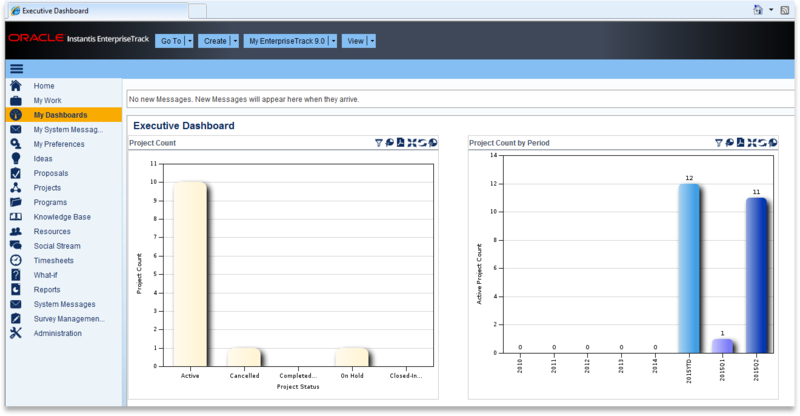 Oracle Accelerate for IT Portfolio Management With Oracle's Instantis EnterpriseTrack includes the following components. 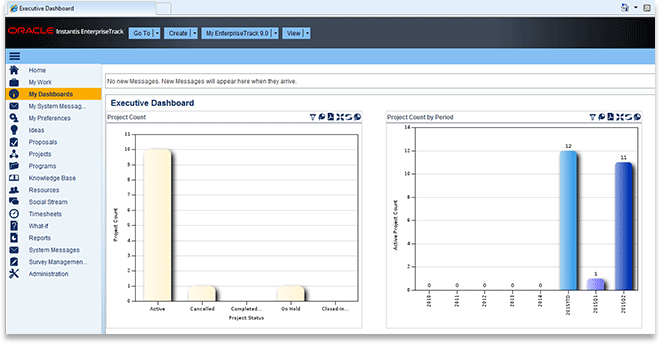 Oracle Instantis EnterpriseTrack is used for demand management, resource management and project management. This solution leverages Instantis for resource capacity, financial forecasting, and project execution via financial templates. Integration design document and data mapping definition between Instantis and the customer's ERP Financials enables cost allocation (labor and non-labor) back to the line of business for which services were performed. This integration with Instantis will provide full forecast-to-actual cost visibility by showing planned, forecasted, and actual costs for reporting and variance analysis. Oracle Accelerate for IT Portfolio Management With Oracle's Instantis EnterpriseTrack couples Oracle Instantis with the customer's ERP Financial applications to eliminate disparate systems and fractured information. Both project and financial managers can continue to use the application most appropriate for their function. Integration between Oracle Instantis EnterpriseTrack and Financials applications facilitates the following. Learn how you can optimize your project and resource investments with cloud-based project portfolio management. Register and watch the webcast here. Read the companion white paper to the webinar above. Register and read it here.